The DC-6 was basically an evolutionary development of the DC-4/C-54. Thought it used the same wing, it had larger engines and a longer fuselage. Thanks to its cabin pressurization, it offered more comfortable passenger amenities than the earlier model. Those who have seen the movie 'The High and the Mighty' have seen a DC-6. The military also purchased the DC-6 as the C-118A. This was basically due to its intercontinental range and large passenger capacity. One thing about old airliners is that they refuse to die and while there may be some still hauling cargo, the most widespread use is as a fire bomber. However, age and increased maintenance costs have reduced the fleet considerably. One of the operators of the DC-6 was Civil Air Transport. By 1950, following the defeat of Chiang's forces and their retreat to Taiwan, the airline faced financial difficulties. The CIA formed a private Delaware corporation called Airdale Corporation, which formed a subsidiary called CAT, Inc. The subsidiary corporation purchased nominal shares of the Civil Air Transport. CAT maintained a civilian appearance by flying scheduled passenger flights while simultaneously using other aircraft in its fleet to fly covert missions. On the civil side, CAT's first flights were carried out with C-46, then C-54 Skymaster aircraft. 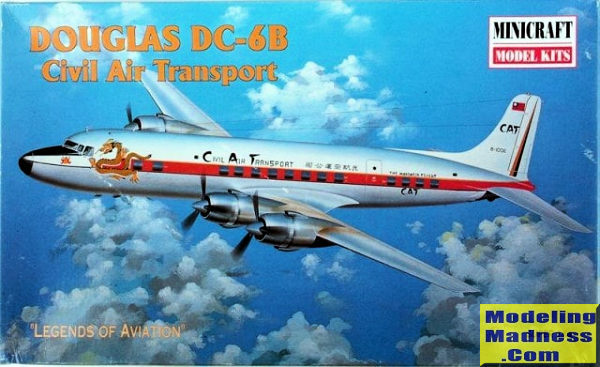 In 1958, CAT inaugurated DC-6B services. In 1961, CAT started to operate a Convair 880M, becoming the first airline to operate pure jet scheduled passenger services on regional routes in the Far East. The Convair 880M was replaced by a Boeing 727 in January 1968. On 16 February 1968 the 727, flying from Hong Kong to Taipei, crashed near Linkou in northern Taiwan, ending 23 years of operations. The remnants of the cargo operation became Flying Tiger. Flying Tiger International merged to Fed Ex Inc.
As is so typical of most kits in today's market, this is about the 3rd boxing of the C-118/DC-6 that Minicraft has produced. Note that I've reused the image of the firebomber for this article. You don't get the tank, but everything else is the same. The DC-6 kit in and of itself is fairly nicely done. The fuselage is slick to allow you to use decals for all the windows. Some airliner builders prefer this and others like to have clear bits included. On this kit the only clear bits are for the cockpit. The various doors and hatches are engraved into the fuselage. The rest of the kit has engraved detail as well; some say it is a bit overstated for this scale, but it looks fine once the kit is built. You also get a cockpit floor and rear bulkhead, but no seats, so you may as well use the decals for the cockpit windows. The kit also includes a wide variety of antennas to be used as the builder sees fit. I found some small sink areas on the tail planes and that was about it for glitches. No ejector pin marks in visible locations and no flash at all. 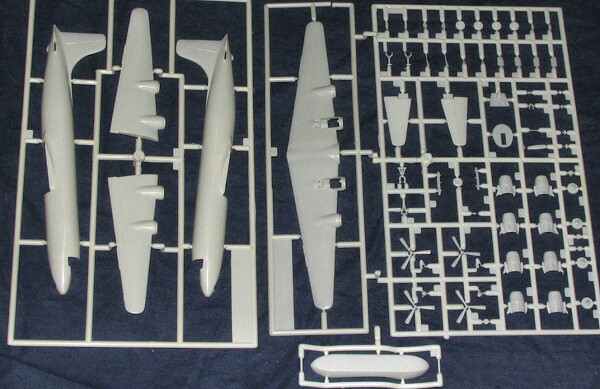 Instructions are well done, and provide a parts layout, nine construction steps and a painting/decal guide. Color information is provided during the construction process where needed. The decal sheet for this one is nicely done and is printed by Scalemaster. Though the box art shows the cheatline to be red, a photo I found on the 'net shows the pink shade to be closer to reality, though the dragon on the front of it is lighter in the photo than it is on the kit sheet. This makes a nice addition to the Minicraft family of airliners and airliner derivatives. Perhaps this livery isn't to everyone's tastes, but the aftermarket crowd has a bunch of alternates if you are so inclined. This one should make into a very nice replica.